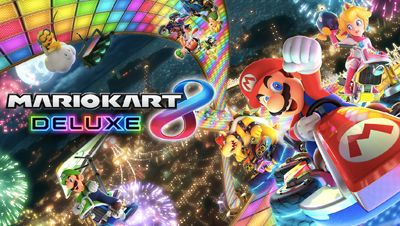 Mario Kart 8 Deluxe; It’s not a remaster, it’s not exactly a re-release, so what, then, is it? The best damn Mario Kart yet, that’s what. We all know the basic gist of Mario Kart, right? Characters from the Mario universe racing each other in karts (and, since Mario Kart Wii, on bikes too), collecting and using Mario-themed power-ups on the way to escape or attack their opponents. The tracks themselves are based on the Mario universe too, with recent years adding some based on other Nintendo games. The original Wii U release saw some top-quality DLC, all of which is included in this ‘deluxe’ version. Therefore, as well as the usual suspects such as Mario, Peach, Bowser and Toad, you can hop into the virtual pants of Link from Zelda or the Villager from Animal Crossing (but why no KK Slider??). You can still race through a few versions of Rainbow Road or around Yoshi Circuit, but then there’s also a version of Big Blue from F-Zero and a neat Animal Crossing themed track (which has a randomly assigned season theme each time you play). MK8 Deluxe is just such a delight to play. The graphics are a cornucopia of colourful joy with a deliciously smooth and impeccable frame rate, the handling is spot-on, and things shift along at a fair old lick at the highest speeds. In fact, the 200cc class introduces what is basically a brand new feature for the series; the need to use the brake button. Here in the 21st Century, choosing your Mario Kart setup makes a significant difference to how the final machine handles. Your character, frame, wheels, and even glider (automatically triggered after big jumps) all have an effect on things like grip and top speed. It’s not just about making your kart or bike look pretty. You’ll need to tailor your choices to the strengths and weaknesses of your racing style and abilities. There’s usually a shortcut or two to zip down, but there are many other elements that can make the difference between victory and defeat. The randomly generated powerups (of which you can now hold two at a time) ensure there’s always a sprinkle of luck, of course. But when and how you use them always makes a difference, as does the choice between holding a tight corner for a boost and taking the safer, but slightly slower, option of sticking to the wider path. As well as throwing in a few extra characters (such as the Splatoon Inklings) and kart/bike parts, Deluxe sees the extremely generous addition of battle modes; which could almost be a whole new game by themselves. Rather than races across tracks, these see players compete in teams – or all against one another – in specially-designed enclosed arenas. Coin Runners for example sees everybody compete for coins. Each coin respawns after a set time, but the best way of climbing the leaderboard is to mercilessly slam other players with shells, ram them while using an invincibility star, or otherwise make them drop coins. The wicked glee of making some poor sod spin out – and then zooming past them, picking up a few of their coins on the way – is undeniable. Another mode, possibly my favourite, is Renegade Roundup. Players are here split into two teams. The ‘Renegades’ have to avoid being caught by the other team, who have blue piranha plants permanently attached to the front of their karts. The plants will automatically bite any Renegade close enough who, once caught, is banished to a jail at the arena’s centre. The jail can be opened by driving over a button beneath it. The game ends when all ‘Renegades’ are caught... or if some or all evade capture until time runs out. Too much content to list it all here, too much fun to resist and races & battles where you can shoot up or down the leaderboard in mere seconds - yet not hate the game for it (not for long, at least). As ferociously addictive online as the best Call of Duty, this is an essential purchase for anybody with a Switch.